For Surinam Airways security is a very serious business. International legislation such as IOSA and the need for better airline security are key elements to make security our priority. 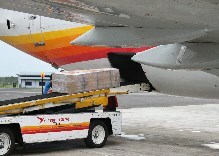 To ensure the safety of passengers and airfreight a lot of security measures have to be taken. To cover these expenses and guarantee the safety of passengers and cargo, a security charge is being added to the freight costs.